Post subject: OOAK Interview with Kees - the interview! 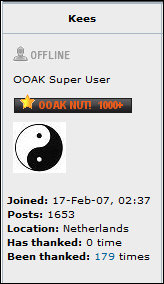 In celebration of OOAK Forum's 10 year anniversary, we asked which forum member we'd like to see interviewed, and not surprisingly Kees came near the top of the list! Kees is well know here in the forum, especially for his very detailed posts and reviews, and his detailed analysis of specific style, especially related to short pimples. True to form, as with some of his epic work and posts, he's responded with an Epic interview, which you'll find below! What came first, your interest in table tennis or your interests of psychology and philosophy? How did you get started in playing table tennis? Have you ever video'd yourself playing table tennis and if yes, what were the first thoughts that went through your mind? No, I never did and that was probably for the best . What is your educational background? Do you have a university degree in engineering? I studied psychology and philosophy; also astronomy for a while. I have a PhD in philosophy. When you conduct your research, who do you approach for it. What factors / processes do you consider necessary for you to go through to try and ensure unbiased research / outcomes? In my opinion, the vast majority of players and coaches in Western-Europe are biased when it comes to styles, techniques and equipment. In comparison, nearly all the Chinese and Eastern-European players and coaches I met were broad-minded, and actually had a much wider and deeper knowledge. So, for a practical approach, I tend to look to the East when I tackle a problem. I think first-hand experience is necessary to appreciate problems and possibilities when it comes to equipment, techniques and styles; so practical testing is a large part of what I do. Fortunately, my sons are always willing to engage in that as well! So research for me is, first, reading up and watching videos, mostly Chinese, second collecting equipment and testing it (also mostly Chinese, since the cost is a factor), third, trying to get to conclusions that make scientifically sense. As you have posted here before, health issues are preventing you from playing too much table tennis. How hard has this been on you, and do you still manage to keep involved? It has been hard. I love the game and I hate being unable to engage in it without holding back. Still, watching at some distance has helped to understand some problems better, and being “handicapped” helped to understand specialized equipment like the Re-Impact blades. When you play people competitively at table tennis, do you take the approach of trying to figure out their strengths and weaknesses first and then exploit what you've learned or do you "play your game" and only if that's not working, change your approach? When I was able to play competitively, I played short-pips attack, which is a style that compels the player to attack all-out. It is quite limited in that sense and quite simple as well, strategically. It consists of a number of routines (attack-patterns) that work pretty much against any kind of opponent. It is mostly a matter of being fast and precise and the only time you get into trouble is when your opponent is faster or more precise, so there is never really a change of approach. These days, when I am able to play, I defend and that is also strategically simple, in much the same way. What's the most difficult style of table tennis player for you to play against and why? It is never a question of style: I just find it difficult to play opponents who are better than me  ! A few years ago, you wrote a fascinating article about the benefits of chopping with a soft blade that has vibrations, as these vibrations allow for a positive feedback. Compared to other feedbacks, such as a visual feedback, how important is the positive feedback through blade vibrations? I have wondered about this question because at the elite levels, e.g., Joo SaeHyuk and other Korean choppers, they like to use the hard Joo SaeHyuk blade with a hard Tenergy 05 rubber. This suggests to me that perhaps the vibrational positive feedback is not that important, at least at the highest levels. I think feedback is important when you learn. Every sensory impression helps to get a complete idea of what a stroke is about. But when you have mastered it, feedback is far less important. In my opinion, feedback during matches isn’t something you can take advantage of, as there is hardly time to learn anything in a match. That is why, as I understand it, pro players use blades with far less control than most amateur players would like to have. What caused you to love Short Pips to the extent to get real good at 'em? Simplicity and effectiveness. Using short pips is straightforward in every sense, so I guess it appeals to my love of clarity. You don't list what equipment you use. What's your favourite setup right now? Joola Toni Hold Whitespot blade with Friendship 837 (0.6mm, red) long pips and Friendship Focus I (1.8mm black) inverted. I've always associated you with your knowledge of Short Pips and was surprised to find that you've been most active on the "The Dream / Re-Impact blades / Achim Answers Questions" within the Blades section of the forum. What type of equipment fascinates you the most and why? Short pips are simple, so there is much less to say about them than about specialized balsa blades. That may explain the difference in volume. For the rest, I am interested in every aspect of table tennis, but I only post on subjects I have extensively researched. When choosing a setup what factors do you consider and in what order would you place them in terms of importance? You have to choose the set-up for your personal style and degree of accomplishment; that comes first. Second comes the cost. Personally, I have always found it a waste of money to spent lots on rubbers that you have to change every 3 months, so we go for no-nonsense, affordable rubbers (Friendship, KTL). A rubber that will keep, like a good anti-spin rubber, I would be willing to pay more for, though. And as for blades, we generally go for the “best buy” kind: good quality for a reasonable price. What's the best setup and game style for older players 60+? At what point do you think players should change to more specialised equipment that enhances their style? That is difficult to say, it varies. A player should, in my opinion, be educated by going through a number of styles, preferably all styles, and learn every technique before he or she adopts an individual style. The easiest method is starting with the short techniques and proceeding to the longer ones; so you start by learning push, block&drive, flick and smash, which are all techniques involving short movements close to the table, then go on to loop and chop, first close to the table, then farther away, until you can cover the entire field using any stroke you want. When you can do that, as a rule it is has become apparent already what kind of stroke and position and type of play you favour, so that is when you start to specialise. I know you've spent a lot of time testing Re-impact blades and talking to Achim Rendler. What do you think it would take for the Achim's business to be more recognised and successful? I have no idea. In fact, I am not interested in the business-side, although I appreciate it is a fact of life. I am only interested in the possibilities for playing table tennis his equipment offers. Choppers tend to use a variety of set-ups on their forehand, e.g., hard blade/hard sponge, hard blade/soft sponge, and soft blade/hard sponge. One often hears that best choice is based on personal preference. Do you think it is possible to objectively claim that one type of set-up is optimal? Yes, but only relative to certain objectives. For instance, if you want to be able to produce heavy backspin but at the same time avoid becoming vulnerable for incoming heavy topspin, you need a hard sponge and a non-tacky surface. Another example: a soft blade will be less effective for quick attack, but a hard blade will be less effective in producing heavy backspin. Years ago, most choppers used slow blades. It was commonly accepted that slower blades enable one to more easily control the ball. However, nowadays, most high level defenders use relatively fast blades, e.g., the Joo blade. Obviously a fast blade is easier for a modern defender to attack with, but I am not convinced that it is harder to chop with a fast blade. For example, it may be easier to perform chops with heavy backspin with a fast blade. Do you have an opinion as to whether it is easier to chop with a slow or a fast blade? Chopping with a slow blade, it is easier to get the ball on the table. The reason why modern defenders use faster blades, is because they want to be able to attack effectively. Classic choppers still use slow blades. If you were to build a top quality table tennis player to compete on your behalf, in a "winner takes all" competition, what characteristics and skill set would you choose for your player? As a coach, my only intent is to assist the player in his or her development. The ability to compete (or win) may or may not be an element in that development, that is up to the player. I have coached and trained high-level players and low-level players, and there is no difference for me – I don’t train or coach them to win, I train or coach them to play. If you could influence ITTF to make 5 rule changes that would have effect for a minimum of 20 years forward, what would you choose? I would like to see 21 point games and no ban on frictionless pips. I'd like to add the question about what to do to give table tennis in his country more acceptance and a higher priority, and does he think that the current subset of actions to support table tennis is appropriate? When it comes to table tennis, there are a lot of problems in The Netherlands. One main problem is the way the Dutch Table tennis federation (NTTB) is structured. Another problem is the way the policy of Dutch local authorities has been killing affordable table tennis training halls. Table tennis should be a popular sport, not an elite sport. And a popular sport should be organized with the practical interests of the players in mind. You have a vast knowledge of the science of table tennis. I assume that much of your knowledge comes from experience. Are there other sources for your background about the science of table tennis? Is part of that background from sports science journals? If it is, are there some particular papers that you would recommend reading? Actually, I do recommend collecting, watching, and analysing table tennis videos. Reality is often a better source for knowledge than theory or opinion. What is your prediction of the future of defensive table tennis? I can't predict anything. But I hope that the recent successes of female defenders will inspire more players to play in that style. But I also hope more players will be attracted to attack with short pips. In fact, I hope for more variation, as variation is a survival factor. Do you think that table tennis attracts more people with engineering/science/mathematics backgrounds than other sports? No. But specific styles may attract people with specific intellectual capacities. For instance, a good looper has to be able to “see” in his mind the trajectory of the ball – you would need a brain that can deal with three dimensions for that. Post subject: Re: OOAK Interview with Kees - the interview! Kees & Haggisv thank you both for this very interesting interview. Since I’ve restarted my TT the information I have been able to acquire from by reading your posts Kees have been extremely helpful in guiding me into my blade & rubber selection. So this interview where we learn more about you & your influences Kees is very enlightening. Thank you again. Nice read Kees! Now why the heck don't you have a custom title? Very enjoyable read guys, thanks Kees, I always love to read your reviews. I vote "Keys to da Pips" for hiz title. I recall he has been asked several times and answered a humble "No thanks". It is his choice and if is still is it should be respected.